Complete results are in from Shoreline, Washington, and the USATF National Masters Combined Events Championships. And if Nadine O’Connor’s otherworldly score of 10,234 points doesn’t impress you, maybe her marks will. Keep in mind she’s 67. She ran the 100 in 14.70 (into a slight wind), threw the discus 21.73 (71-3 1/2), long-jumped 4.23 (13-10 1/2), put the shot 7.87 (25-10), high-jumped 1.27 (4-2), ran the 400 in 79.28, ran the 80-meter hurdles in 14.80 into a wind, pole-vaulted 3.05 (10-0), threw the javelin 18.15 (59-6 3/4) and ran the 1500 in 7:35.18 — not necessarily in that order. If Nadine had competed at Lahti worlds, she would have gotten gold in the vault, silvers in the high jump and long jump and bronze in the hurdles (and maybe silver, since Lahti had an aiding wind). 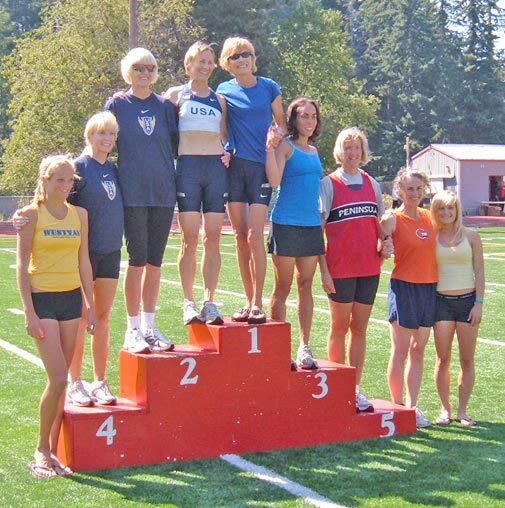 In the W55 age group, fresh-from-Lahti hep WR-setter Rita Hanscom set another record with 8899 in the Shoreline dec.
Rita Hanscom (USA top) and Nadine O’Connor were top women at deca meet. Now the news: Nadine’s score — established by converting her marks into comparable “open” marks using the Age-Graded Tables and then plugging the converted marks into the IAAF decathlon scoring tables — may very well come down next year when World Masters Athletics rolls out its new Age-Graded Tables. WMA doesn’t list women’s decathlon records, but all previous combined events records — including the hep and throws pentathlon — will have to be re-scored, I’m told. But this I’m sure of: Outliers — fanstastic records far ahead of the age-group curve — will no longer skew the Age-Graded Tables and allow for extremes of age-grading. For example, Nadine’s 3.05 vault is worth 1,963 points. I’m hoping to learn soon what Nadine’s marks generate on the new Age-Graded Tables, which Germany tested this past season. if WMA does not list women’s decathlon records, who is the keeper of these particular records? Does WMA keep them but simply not publish them? I wonder if WMA realises how silly they look by failing to acknowledge Nadine’s and Rita’s decathlon performances. Some day the organization will catch up to its athletes, perhaps! Thanks, Ken, for the detailed and very kind article and many thanks to others for the thoughtful emails and congrats. I hope your story encourages others to try this challenging, yet rewarding event. The biggest thanks should go to the many officials and volunteers who made it all possible. Daunte Gauge was a man with many tasks, from sweeping the runways to fluffing up to long jump pit to manning the computers and running with the current point totals to each competitor. All officials were encouraging, yet professional. And, to my deca lady friends, thank you for making this all so much fun. It never felt like a competition, but more like a team event where we were all encouraging and trying to help each other do better. I also liked the fact that there were so many ages competing together. The young girls showed us all what speed really is. They will continue to improve and hopefully enjoy the sport. It will be fun to watch them in the future. All of the competitors were amazing and will continue to improve. But, I want to especially note Rita’s performance. It is much harder for the younger athletes to get high scores and her 8999 was a superb effort, made even more noteworthy after returning from Lahti and her great performances there. For a non-distance runner to gut out a 6 minute 1500 is impressive. Nadine, who wants to learn how to throw the javelin. Anyone know a good coach? I’d like to repeat Nadine’s comments on what a well-run meet it was. Kudos to Daunte Gouge and helpers and officials for making it such a good meet. Printed point total updates after almost every event -awesome. I feel Nadines comments about the lady decathletes ” ..(it felt) more like a team event where we were all encouraging and trying to help each other do better..” applies to the men as well. I’d like to thank my competitors for the help and encouragement they gave me, which certainly helped my performance overall. A really great thing about doing decathlon is that you spend 2 days with your competitors, with all the comaraderie that would entail. On a last note, I nominate Nadine and Rita as Co-Masters Athlete of the Year. Daphne, I believe we cannot fault the WMA in this. It is our dear governing body IAAF (those are the folks currently running the world championship in Berlin)that does not recognize the decathlon as a competition for female athletes. Of course, this is ridiculous. After certifying the pole vault for women, there was nothing that would have prevented the IAAF from starting the W decathlon. There are many discussions about this. I believe that rather sooner than later the IAAF will have a plan, maybe starting at the junior level or making it an unofficial event for a short period of time (like the W triple jump). Naturally, the WMA would follow right away and make it an official event. The athletes certainly are ready to get going. Also, as it was done already by WMA for senior athletes with the new scoring system, IAAF should look at the scoring tables for the W hepthathon/decathlon. Nearly all experts believe it to be unbalanced. 3 years ago I did an online webpage describing the 2006 USA Masters Decathlon/Heptathlon, which took place at the same facility as this year’s. It indicates some of the fun of participating in a decathlon, as well as showing a comparison of how Nadine and Rita did in their first decathlon then, to how even better they did at this year’s meet. Weia, I stand corrected. IAAF rule 200 mentions the decathlon for women as well. So, it is an official event that is officially ignored. Why don’t they switch to the decathlon at the IAAF championships and at the Olympic Games? I fear most heptathletes are not willing to switch. I asked a few of them, Olympians, and it was a definite ‘no’. Well, now it fits a bit more into the mold and the intend of the Model 2010. Victor Trkal & Bernd Rehpennig will be proud. Nadine O’Connor is truly a remarkable women and a world class athlete, that much is sure. But the new scoring system holds up and shows her to be within the point range of the elite athletes in the IAAF events. Three years ago in 2006, screw-ups with wind gauge reporting in the M50 National Masters Decathlon (Multi-events) Championships at King’s High School in Shoreline, WA cost Bill Murray an American Record. This year they again appear to have had multiple failures (NWI) “no wind information” in the wind gauge system as shown below. Fortunately, this did not appear to happen to Nadine O’Connor!! When a national masters meet twice can not handle the basics of providing accurate measurements, they should be barred from further championships bids. And they should refund your entry fee!! And entry fee refunds should be provided for FAT timing failures at masters outdoor/indoor championships, as well. Strange: Nadine and I were in the exact same 100m race – same heat, so if Nadine has wind info then my result should have too. Perhaps there was an entry error? I know the 100m results were corrected once at the track – may be that was when the wind info got lost? By the time I queried the results, Duante had already found and corrected the data errors with USATF – just not updated the results site. Thanks for the speedy work with all that data Duante. In response to Ortman;s rants the problem with Wind was not on the behalf of our staff. We sent in all the proper paper work with wind reading s to the USATF. It was people at USATF that costed Bill not us. It is not a rant to expect that all outdoor national masters championship results be posted with all required wind gauge readings.